Roe Rovers managed to secure a vital three points during a heated exchange with high flyers Eglinton, at Roe Mill Road. The Limavady men had to battle all the way to secure their 4-2 victory, on Saturday. The only goal of the first half came after just one minute when Jack McGonigle delivered a dangerous ball into the box from a corner causing havoc in the Eglinton box, there were shouts for handball but Conor Mullan played to the whistle and smashed the ball into the top corner from close range. A bit of a shock to the system early on for an Eglinton side that were hoping to bounce back after losing some ground at the top of the league last week. They found it difficult from the get go in Limavady, as the pace of Rovers’ number 10 Paddy Logue caused a lot of problems for the Eglinton defence. Logue was released in behind the Eglinton defence on a number of occasions early on making busy work for centre backs Niall McKinney and Michael Lynch. Eglinton finished the half on top, but the combination of Jay Clyde and Tommy Hassan looked very comfortable leading the Rovers’ defence. The bulk of the action came in the second half as Eglinton came out of the blocks searching for an equaliser. Substitute Steven McCloskey’s long throws would cause problems for Rovers for the rest of the game and three minutes into the second half, Bryan Duffy got onto the end of a McCloskey throw in, heading the ball narrowly over the bar. Minutes later Eglinton were provided with their incisive opportunity. A ball cleared from the edge of the Eglinton box made its way in behind the Rovers’ defence to an unmarked Tom Forrest, goalkeeper Cain Breslin rushed out to meet Forrest but the Eglinton striker coolly slotted the ball inside the left hand post levelling the game. Isn’t there an old saying about your defence being at its most vulnerable as soon as you score, well Eglinton were left shaking their heads in disbelief as Rovers attacked from the restart and regained their lead. A good save from Eglinton’s number one Andrew Pierce fell kindly to the feet of Jack McGonigle who was making no mistake from a few yards out. With a game on their hands but not out of sight Eglinton immediately brought on an extra forward in the form of target-man Barry Murray. It was at this point around the 60th minute mark that the game took a bit of a turn. 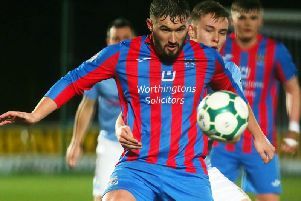 A recklessly miss-timed challenge by Eglinton left-back McCloskey flattened Rovers’ winger Jack McGonigle, resulting in the first of five yellow cards in the match, as well as an altercation between players and staff. Fired up, Rovers continued to press trying to seal the win, while Eglinton kept battling to get back in it resulting in a very open and scrappy affair for the last half hour. Rovers managed to extend their lead shortly after when a ball which fell to the edge of the Eglinton box was smashed home superbly by wing-back Daryl Mulgrew. All was not over yet however, as minutes later an Eglinton free-kick whipped in by Ryan Barr found its way to substitute Murray at the back post who tapped in from close range making it 3-2 with 25 minutes to go. Rovers relied heavily on their defensive capabilities for the rest on the 90 minutes as the Eglinton onslaught continued. After Cain Breslin clattered through the Eglinton forward line in order to clear a cross, the loose ball fell to the feet of Tom Forrest at the edge of the box who’s shot was cleared off the line by Mulgrew. With the last kick of the game, a miss-judged back pass was intercepted by Rovers’ player coach David Harkin, who made no mistake sealing a deserved but flattering three points for the Roesiders.